The Dignified Rant: String of Pearl Harbor? Is India in more danger from China than we think? It is good from our point of view that Pakistan is finally seeing their own domestic jihadis as a threat to Pakistan rather than India and that India is moving to block Chinese moves to dominate Pakistan. Recent moves can reinforce further moves in a virtuous cycle. Tensions between China and India have intensified in recent days, with Chinese Foreign Ministry spokesman Qin Gang on Thursday rejecting recent Indian claims concerning increased border incursions from China. He called for Indian officials and media to temper their language and work toward cooperative relations. As Beijing grows more dependent upon international trade and imports of energy and raw materials, it has sought to expand its ability to defend those supply lines against potential disruption. One of the most critical supply lines runs through the Indian Ocean, from Africa and the Middle East. Theoretically, this places the Chinese supply routes at the mercy of Indian naval interdiction. And while New Delhi might have no intention of interrupting Chinese supplies, the capability to do so cannot be simply dismissed. As a result, Chinese companies have been heavily engaged in port expansion projects in Myanmar, Bangladesh, Sri Lanka and Pakistan — all of which lie along this strategic trade route. From the Indian point of view, however, Chinese movements in these states are all part of a grand strategy by Beijing to encircle the subcontinent and choke off India’s potential to become a global power. Indian defense planners also argue that while the military’s focus has been mainly on Pakistan, India’s chief rival to the west, the Chinese have been building up their military presence in the neglected northeast and moving to assume de facto control over the disputed region. In their eyes, it’s time for India to play catch-up — and the way to start is by sending more forces to the east, to remind the Chinese of the seriousness of India’s territorial claims. China, it is pointed out, is at the mercy of Indian naval power to maintain their oil imports from the Middle East. I basically agree. China would have difficulty projecting conventional naval power past Taiwan and through an American gauntlet that runs through choke points at Singapore and Indonesia. Even with Chinese bases in Burma, Sri Lanka, Bangladesh, and Pakistan that can provide reconnaissance, what good would they do if Chinese ships and subs can't reach the Indian Ocean for anything more than a raid with relatively small numbers? But then I thought of China's so-called "assassin's mace" weapon they are developing, the anti-ship ballistic missile. Our big carriers are the prime target. But our Navy would still be far superior to China's navy even if every aircraft carrier was destroyed by China. True, knocking our carriers out--even just our forward-deployed carriers--would mean that China probably gets the time it needs to conquer Taiwan. But if the war continued our fleet with its missile-armed ships and subs supported by land-based air power would defeat the Chinese navy. 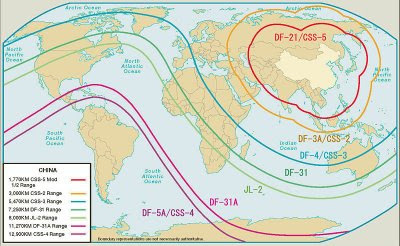 Might not a rain of anti-ship ballistic missiles nullify India's carrier fleet and smash up even their larger surface combatants, keeping China's line of supply largely unmolested? We may be nervous about the potential of the DF-21 to be a carrier killer, but the Indians should be sweating bullets over this prospect. For India, it could be a fleet killer.